It is yet another busy day for Kate, she started the morning at Prince Philip’s 90th birthday service. Below, a better look at some of the detailing on the coat. A nice Sunday morning look, appropriate to the occasion. We are eager to see who did Kate’s earrings, from our uneducated perspective they look new, and almost like they match the engagement ring. As mentioned in our previous post about Kate’s McQueen/Treacy styles for Trooping the Colour, the Duchess had a busy calendar today, this afternoon she and sister Pippa attended the wedding of close friends Sam Waley-Cohen and Bella Ballin. Unless we’re mistaken, everything Kate wore has been seen previously. 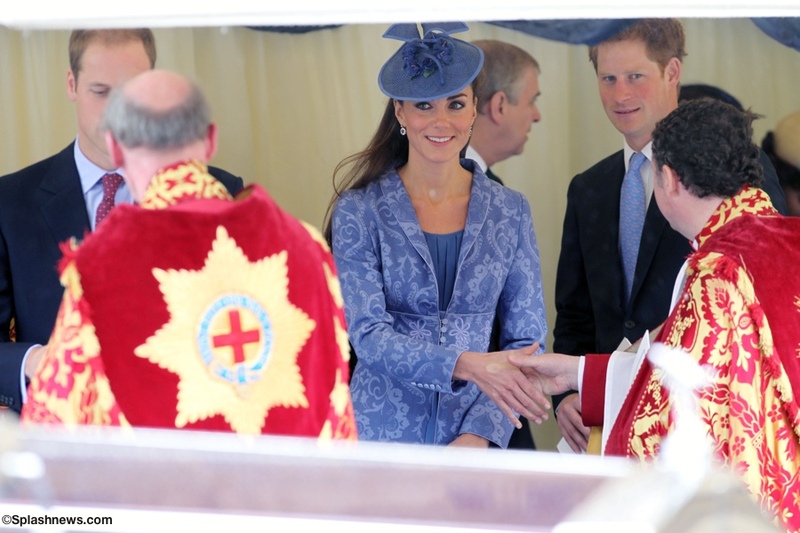 Kate went for a simple satin sheath in black and white, topped by the hat worn for this morning’s ceremonies. We believe she is wearing the same Links of London earrings worn Thursday night at the ARK dinner, the Effervescence Bubble Earrings are still available on the US website, but we can no longer locate them on the UK site. The earrings feature tiny lavender iolites at the top, they are $215 USD. Our eagle-eyed readers and WKW Facebook fans noted this is not the first time we have seen Kate in the satin dress, previously wearing it in 2007 as she left the Boujis Nightclub. Nor do we believe it is the first appearance for the black court shoes, they look to be the same pair worn when William and Kate met the President and Mrs. Obama. If not the identical pair, they are very similar, we continue the hunt for the maker. 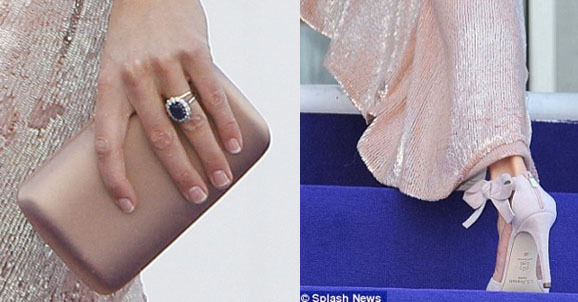 Kate’s clutch has also been seen previously, most recently at that same meeting with the Obamas. 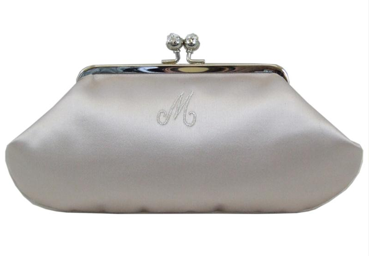 It is the Anya Hindmarch Maud silk clutch in black, below we show the bag in ivory. It is no longer available, but one can sign up for a waiting list for the bespoke version of the bag at the Hindmarch website. All in all it was a subdued yet stylish look for the Duchess, surely sensitive to the attention that would be directed toward her, wanting to ensure that focus remained on the star of the day, the bride. 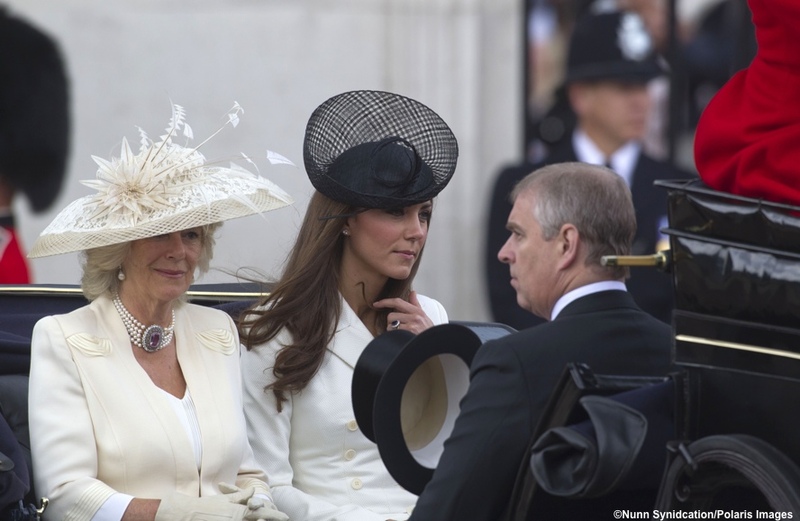 With special thanks to Ciara, Diana, Carly-Kate Middleton Style FB, Leaf and Pearls Blog. 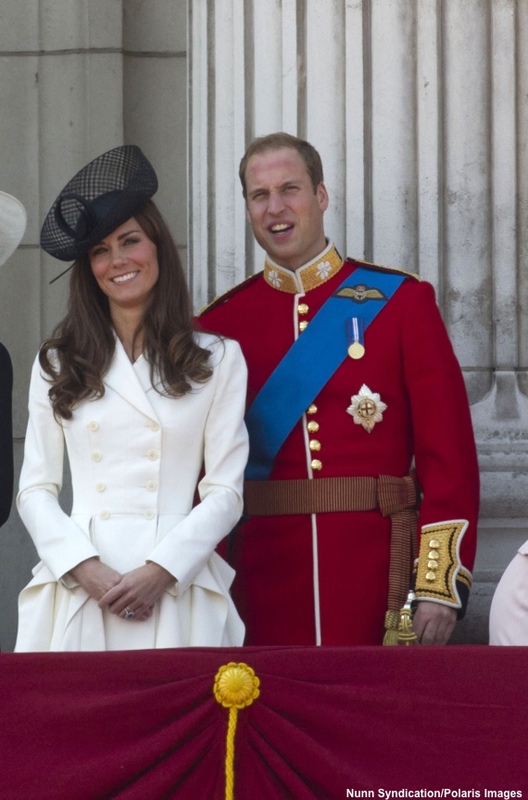 Kate’s look for her first appearance at Trooping the Colour, the official commemoration of Queen Elizabeth’s birthday. (Also the first time Prince William has taken part riding in the event.) So many fashionable friends emailed, tweeted, or left comments on the WKW Facebook page about Kate’s coat-dress it is difficult thank everyone, but it looks like LiltingLimes’s tweet was an early tip-off to the designer, Alexander McQueen. The coat was priced at $3845 USD. It is interesting that once again she opted for white, this is the third time in recent weeks we have seen her go for a solid, monochromatic look. UPDATED 7.16.2011: A helpful commenter asked about the hat, noting that many outlets are saying it is by Lock & Company, a firm known to most WKW readers. We tend to think that TH, the person kind enough to leave the comment, is correct, it is a Sylvia Fletcher creation by Lock and Company. It is possible the Palace doesn’t want too much focus on Kate (we would never suggest such a thing) attention paid to Kate’s apparel and accessories; in reality however, that train has left the station. The fact is the fascination with what Kate wears and ensuing frenzy will only intensify moving forward, it is something the Palace cannot control. While Kate looked lovely for the ceremony, this was not our favorite look from her; the coat was a little too frou-frou, despite it flattering her slim figure and healthy glow. We know many sophisticated observers are probably delighted to see a more fashion-forward statement from the Duchess, it is merely not a style we are fond of. Most assuredly not a miss, just not the best we’ve seen. Tonight’s appearance by Kate and William at the annual ARK (Absolute Return for Kids) dinner was important for a variety of reasons: it was the couple’s first formal engagement since their wedding, and William was also delivering the keynote address. With the pressure on, Kate did not disappoint, selecting a gown by another British designer, Jenny Packham. The dress is from the designer’s Spring 2011 RTW (ready to wear) Collection, it shimmered in the early evening light as the couple arrived. Ms. Packham is known for her elegant bridal and formal gowns, she is a Central St Martins graduate, as well as a favorite of celebrities, recently Angelina Jolie, Sandra Bullock and Taylor Swift have been spotted in the designer’s dresses. There was a significant amount of buzz about the same Jenny Packham dress being featured in an April episode of Gossip Girl. As it runs out, it was a similar dress, but not an identical piece. Above is the original graphic from the good folks at Red Carpet Fashion Awards, we added the photo on the right showing the dress worn on the show, you can see that primary differences are the length and embellishment. Kate again opted for LK Bennett footwear. She wore the Agata Sandals in rose suede, with a side bow and zipper up the back (oh my! ), and 4″ heel. The bag is Prada’s Pink Satin Logo Box Clutch, currently available at Bluefly for $556 USD. 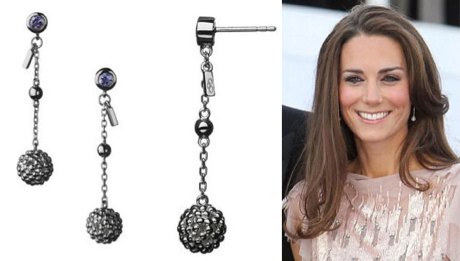 The earrings are aptly named, the Effervescent Bubble Stiletto earrings by a Kate favorite, Links of London. The earrings dangle freely, featuring tiny lavender iolites stones at the top. They are available on the US website at $475, or £275 on the UK site. The gown was an outstanding choice, an elegant, sophisticated look that turned things up a notch. The Duchess looked radiant, and very, very happy. And once again, she wore the dress, it did not wear her. Kate scooted out for some quick shopping this morning. The Duchess actually looks a little harried as she runs errands, stopping by storied hatmakers Lock and Co. 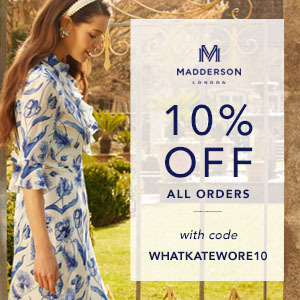 The LK Bennett Maddox wedge shoes she is wearing will be familiar to many readers, it also looks like she is wearing the Links of London Hope Egg earrings again. The frock looks like Issa’s oh-so-popular ‘Lucky’ dress, we thank the eagle-eyed Melissa, she initially pointed this out to us on the WKW Faceboook page. Kate has demonstrated her fondness for the dress, she has been seen wearing it on multiple occasions in different colors, including the white version to Wimbledon in 2008. The ‘Lucky’ was an immensely popular style, worn by a number of celebrities, to read more about that, click here for the Daily Mail’s June 2008 story on the topic. The cotton dress is flattering on almost every figure, with its squared neck and pintucked bodice, along with the gathered waist that flows into a flared skirt. 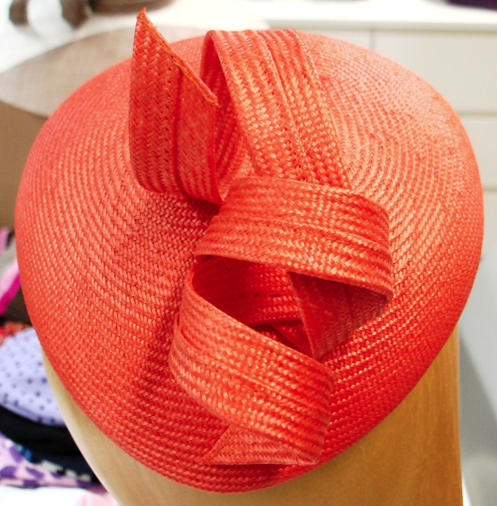 Whiteley also did the hat Kate wore to the January wedding of good friends Harry Aubrey-Fletcher and Louise Stourton, she paired it with Libelula Dulwich Coat (more on that here). The black hat is Whiteley style #526/422K, a black velour hat with quill. Our thanks to Paul at Whiteley for his generous assistance! 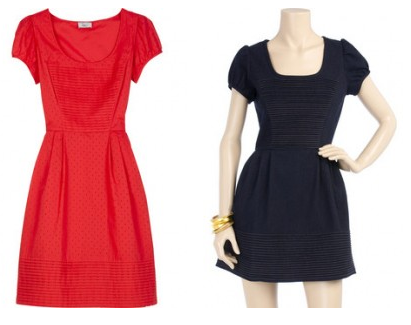 And of course, we’ll have a full post on what Kate wears tonight for the ARK benefit as soon as we have those photos.